The customer service at the hotel was outstanding, warm and extremely welcoming. Hotel was nicely appointed and updated throughout. Room was comfortable, clean and quiet. Our dinner at the restaurant was delicious and waitress very friendly. Shuttle service also excellent and again very friendly and welcoming. Conveniently, only five minutes from BWI airport. We will definitely stay here again and highly recommend this hotel. It was good to get a good night’s sleep before flying the next day. Shuttle service was excellent. Jackie was at the front desk and was immensely helpful and cheerful. Love to be able to park at the hotel. Only stayed one night prior to flight. Room was comfortable, clean and quiet. Shuttle service was excellent both taking us to the airport and picking us up on our return. Check in was quick and efficient and we were able to park in a well lighted spot. The hotel restaurant was closed Sunday but the full menu is available at the bar and it was all very good. Lobby and common areas are large and spacious. Room is adequate, comfortable bed and linens, very small bathroom for two travelers, probably just right fro business travelers alone. As often the case, mediocre coffee in the room, some available in the lobby when we checked out at 5 am. Shuttle ride to the airport was about 5 minutes! Convenient and a very comfortable bed! Enjoyed the stay from arrival when a staff me.ber helped me with our bags, to having a very nice room and trouble free ride to fhe airport. The hotel staff were very friendly, made the check in process smooth, and the room was clean and comfortable. The warm cookies were a plus! The shuttle to the airport was on time and the driver was professional and courteous. Could not ask for more! Location was very close to BWI. Check in was smooth and easy. Room was clean and comfortable. Plenty of parking. Shuttle service to and from airport was excellent. Only complaint would be that there was no complimentary morning coffee or breakfast. 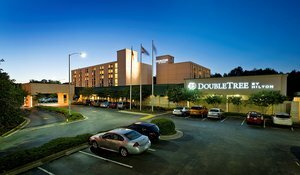 Doubletree is the only hotel I stay at when I'm traveling. Friendly, courteous staff, parking lot is lighted, shuttle to airport is on time. Booked four rooms five months in advance and overall things were great. Rooms were not close to each other at all. The one room did not have king size bed. Others had no fridge or microwave. Only stayed one night so it was fine. Would consider using again.